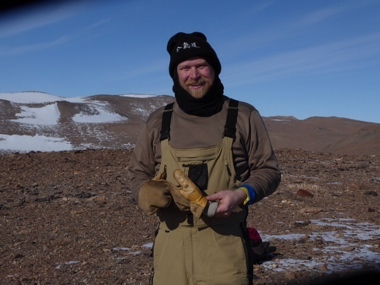 Jim enjoys one of those warm, calm, beautiful Antarctic days of which we no longer have any. With yet another tent day keeping us captive, I was able to corner a very reluctant Jim to get the scoop on our field science lead and ANSMET co-PI. Jim clearly doesn’t like being the center of attention but too bad because today is his day in the spotlight! It was definitely worth it, at least for all of us curious fans, maybe not for Jim. I’ve known Jim a long time and I still learned quite a few interesting new facts that I didn’t know. Read on to hear about how it’s possible to rise to the top of this project even if you break the PI’s foot early on in your career. geology major. Since Bemidji was a space grant institution, I was also able to minor in space studies. One of my professors there was John Annexstad, who was a secretary for the Apollo program and also the first NASA rep on ANSMET. I met Ralph [current co-PI of ANSMET] through John while I was doing a summer internship at the University of Tennessee Knoxville, where Ralph was a postdoc and just starting to be more involved in ANSMET. I actually broke Ralph’s toe playing pickup basketball–he jammed his foot into mine and just snapped it! (note from RPH- I have glass feet). After finishing my undergrad I went to the University of New Mexico for a PhD. I went to UNM because of Jim Papike [then the director of the Institute of Meteoritics at UNM], who is from Eveleth, MN. Eveleth is a big hockey town; not only had Jim played hockey himself, his dad was actually a pro hockey player. My undergrad professor John Annexstad knew Jim and introduced us. While at UNM I did a master’s on interplanetary dust analogs, where I analyzed synthesized vapor phase condensates. After my master’s I worked at an environmental firm in Albuquerque named Compa for several years. After that I went back to UNM as a lab assistant for the microprobe and eventually decided to go back for a PhD. I studied and compared the mineralogy of basalts from the Earth, Moon, Vesta, and Mars (including some samples from ANSMET). After my PhD I did a postdoc at UNM and then transitioned into a research scientist position there. In 2009 I left UNM for Case Western Reserve University, where I am currently a Senior Research Associate. It sounds like you knew about ANSMET for a long time before joining up. How did you first become involved? : Like everyone, it took some courage for me to write that first letter to Ralph, which I didn’t do until I was a postdoc. I was lucky enough to be selected and now I’ve been coming for the past eight years straight. I’ve always been interested in meteorites and also in finding treasure! When I was a kid I used to search for and collect golf balls that had been hit across the road from a local golf course, and then I’d sell them to golfers [Nina’s note: This is the definition of ‘ballsy’]. I’ve always loved the thrill of the hunt! Even after eight years the thrill of finding meteorites is still there for me. I also don’t really mind the cold. Where I grew up in Grand Forks, ND is one of the coldest places in the U.S. other than Alaska, and we always did a lot of outdoor winter activities like hockey (you didn’t get to play in an indoors rink until you were in high school). I started becoming involved as more than an ANSMET volunteer when I went to Case, where I started as a postdoc with Ralph working on ANSMET. As co-PI now I’m learning about planning a season, budgeting, and the whole McMurdo system, including cargo, flights, etc. On selecting ANSMET volunteers: I look for the hunger to find meteorites. It’s also important to have been cold before. Family: I have a lovely wife Kris and an adorable daughter Adelaide (Addie), age 20 months. I also have four sisters and lots of nieces and nephews. We also have two dogs, Lucy and Missy, who predated Addie. They love Addie–one sits on each side of her high chair when she eats! My wife Kris made me a book of family pictures called Addie and Daddy to bring with me, and she also reads it to Addie every night while I’m gone [Nina’s note: This book is ridiculously adorable and I want to read it again myself]. I think that having a kid makes you see the world in a different way. Tell us about your hair: I just let it grow in the field. I usually wash it once [Nina’s note: We were all deeply impressed when Jim took a field bath that included shampoo. He’s the cleanest person out here by far]. When I get back I usually get a haircut and shave off my whole beard and start over. I’ve never shaved my head for any reason but I want to do it–maybe next time? Hobbies: I love doing laundry in my spare time. I also play hockey and handball [Nina’s note: Jim is being modest–he is a frakkin handball master champion. I can only assume the same for his hockey and laundry skills.] (Note from RPH, Nina is right. Jim’s won several NCAA Div III hockey championships for Bemidji and last I heard was ranked in the top 3 in the US in Master’s Handball). If you could choose between flying or being invisible? : I’d choose flying, because I’ve had some great dreams about flying. I’d probably use it to zip around locally, I’d still take a plane to Antarctica. I just had a dream out here that I got a business class upgrade on Emirates on the way back home–here’s hoping that dreams really do come true. Secret talent: I have a super good memory for remembering the names of actors and actresses in movies. Johnny’s secret talent according to Jim: Johnny has an incredible memory. Little known fact: I used to raise homing pigeons from eggs. Jim’s message to the world: Dont go to school kids, just play hockey. Just kidding, I don’t have a message.